The action just never stops here! Wednesday I showed up at the hospital at 6 a.m. to have my A-Flutter fixed. It was easy. I just fell asleep and let the staff take care of things. They seem to have me all fixed up. I made it to my family's Thanksgiving at my Mom's apartment. My brother Eric and his family came out from Virginia. 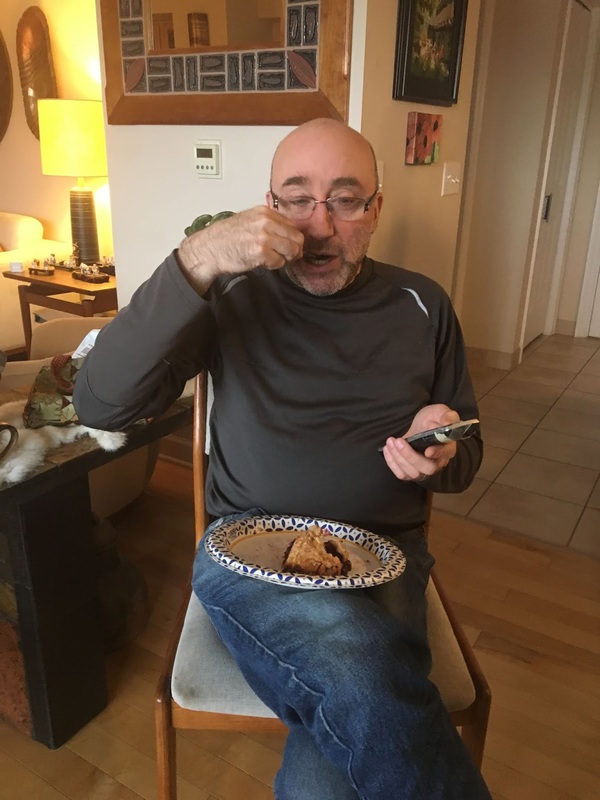 My other brother, Michael (in Washington, DC), baked us two amazing pies (cherry and apple) and mailed them to us. Above, Eric is enjoying a piece of cherry. It was surreal without my dad. It just hasn't fully sunk in yet. The pattern is the Soundwaves Shawl, and it is perfect TV knitting. Easy but not boring. 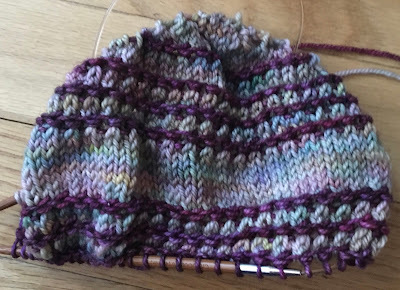 The yarn has been in my queue for years: Dream in Color Smooshy with Cashmere. Can you even imagine? It is truly smooshy. I am about to start a mega knitting project. Probably the most ambitious thing I will ever attempt. Does that have you waiting for my next post? It's been a bit crazy here. Between my dad's death and his funeral, I ended up being admitted to the hospital with Atrial Flutter. It's kind of like the more common A-Fib, but I'm way too queasy to explain the difference to you. What I can tell you is that when your heart isn't working right, you feel just awful! The good news is that it can be fixed with a procedure call ablation. The bad news is that I am so queasy that I almost passed out when the cardiologist tried to explain the procedure to me. "I usually don't put patients out for this," he said, "but I think I'm going to have to in this case." I second that! 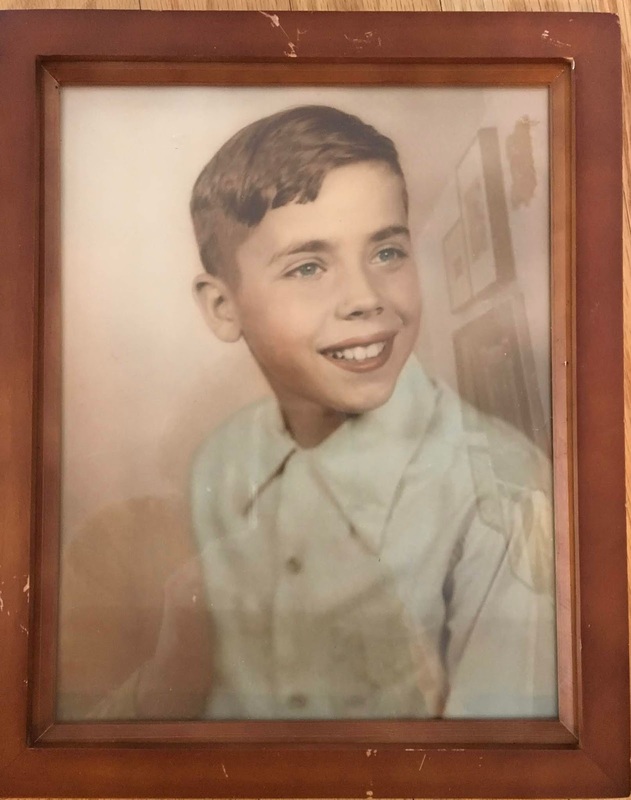 My dad as a boy. I think his openness and sweetness really shows itself. I was out of the hospital in time for the funeral. For the first time, I really understood the Jewish tradition of family and friends placing the first shovelfuls of dirt on the coffin. There is something very comforting about being part of that process, although it was extremely emotional for my mom. He hasn't been his "real" self for many years, but the finality of death is always difficult to grapple with. He was a kind, smart, funny man who wanted to help others. One of our struggles after the dementia set in was that he wanted to donate insane amounts of money to public schools and other good causes. His goodness was appreciated in my hometown, so the funeral was well-attended. It was a fitting end to a life well-lived. Because it was such a crazy week, I don't feel like the loss has hit me fully yet. As you can imagine, I have not gotten much knitting done. 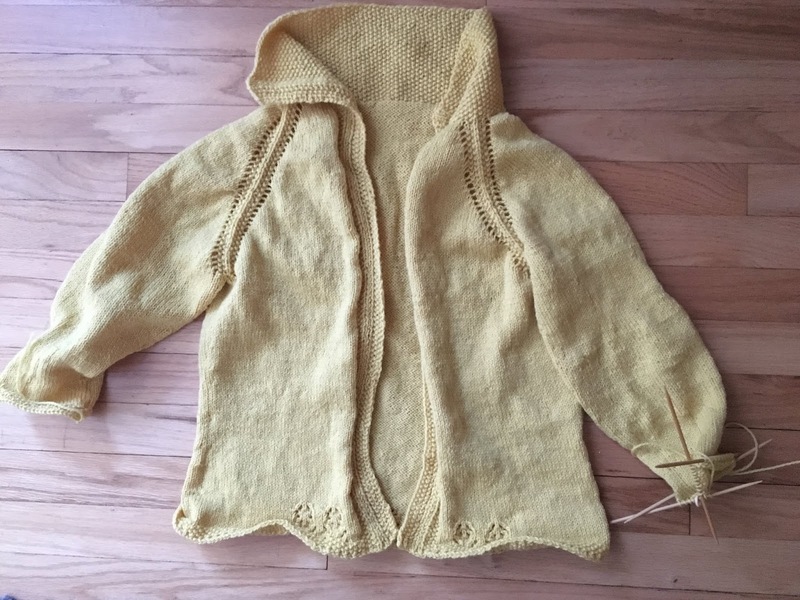 It is taking me forever to finish the second sleeve on my Vodka Lemonade sweater ... but I'm almost there! This weekend I've been reading blogs and enjoying catching up with you! It's been almost exactly a month since I last posted. I hope to be back online soon, but for the next week I'll be focused on my family. After a decade of struggling with dementia, my father passed away this morning. It was surprise. In my experience, it always is. My first father-in-law was in a coma for days before he died, and still it was a shock when he left us. Out of respect for my dad, I haven't said much about his illness. It has been a very difficult decade. He suffered from frontal-temporal dementia, and it turned the sweetest man in the world in to a very angry person. The kind, funny, smart man who raised me hasn't been around for quite a few years. He is in a better place. I will always miss him.